Since 1990 The Resurrection Project (TRP) has empowered residents and worked with communities to help them overcome obstacles. As part of their initiative, they are hosting informational sessions every Tuesday welcoming the community and all DACA recipients to become informed calling it DACA Tuesdays through October 3rd. TRP wants to keep the community informed about any DACA related changes and all the options available for DACA recipients. “To not let fear stop them from taking advantage or for fighting for a more permanent legislation form, really staying involved in the community,” said Laura Mendoza, Immigration Organizer of TRP and also DACA recipient, in regards to DACA Tuesdays. “I started as a volunteer to help fill out DACA applications and citizenship applications, this was something that I needed to do because as an immigrant and DACA recipient myself, I felt I needed to give back with my time,” said Mendoza. 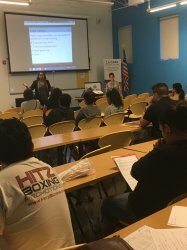 The session covered all the necessary information related deadlines, financial options, work permits, how to secure your job, and legal options as many other topics associated with DACA. “I came to get more information on DACA renewal and see what solutions we could do. 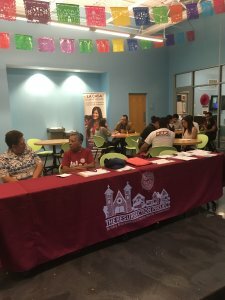 Also, I know they are providing legal systems to help us file the applications, and they are somewhat complex applications so it’s nice to have someone to help us,” said Marco Mancera, one of the attendees at the event and also DACA recipient. Mancera also expressed concern over President Trump ending DACA in hopes of a replacement to become a legalization. “I think it’s just a political strategy on his part allowing by congress to take over when they have not had any success in the past. So he should have just left it till they find a replacement. I don’t think they will find a replacement, not within six months,” said Mancera. Once the presentation ended, the attendees were called individually to assist them in what they needed help related to DACA. Carlos Millan who is the coordinator for Education Partnership at TRP was one of them who assisted the attendees. “There’s a lot of misinformation out there. One is to clarify what has happened, what will happen and what we know so far to the public. We understand that our population, if they are informed, has the power to renew or to look for other immigration benefits, so our mission for this event is to inform the public of what has happened and what they can do as of now and to connect them to immigration services that they can trust,” said Millan. Millan emphasized the importance of DACA recipients to get fair good legal services. “We do know our population has been over years falling pretty to notary fraud, and just you know, fake immigration attorneys, people submitting applications falsely for them and we don’t want that for them. We want to make sure they get good legal services, especially with immigration,” said Millan. The next DACA Tuesday will take place on October 3rd at 1805 S. Ashland Ave., at 5:30p.m.